Samsung Galaxy S6 launched in 2015, is a step up from the previous range of Galaxy devices. According to me the S6 stands for 3 things - Sleek, Smart , Savvy. Now when I mean Sleek - This phone is quite sleek in comparison to the previous gen Galaxy range of smartphones, it feels premium to hold and the best part of the design is not curvy nor does it have the plastic back case. The phone is completely ensconced by Gorilla Glass, which does make it delicate to handle but you will like it, it comes across as more premium and a worthy competitor to the iPhone 6. Smart - The phone can be a one stop shop for your family&apos;s daily remote tussle in the living room, You can program it according to your rooms requirement (AC, TV and DTH) and voila here it is on the peel remote. Pretty cool I must say for a phone than can completely replace your remote! Savvy as in the phone does know what you need and is clearly adept at fulfilling your requirement&apos;s being it the worthy camera or the the finger print sensor or the fast processor (not getting into specs). One more advantage is this phone is for the disabled friendly - visually impaired coupled with the dexterity of the phone makes it a great buy. All in all i would like to conclude the S6 does definitely pack a punch and is a good buy. The new S6 has a more premium look as it is made up of a mixture of glass and metal It comes with a 16/5 MP rear/front camera along with the auto-HDR feature to automatically control the white balance and smart Optical Image Stabilization to keep the shake away. The new S6 features a resolution of 557 ppi, the highest ever for a smartphone. The 2550mAh non-removable battery is a major drawback in S6. The other downside of the S6 is its absence of a microSD card slot. Some also believe that the absence of waterproofing which was available in S5 will also have its consequences. Samsung galaxy s6 is a perfect combination of looks and performance. The glass back of the phone makes it classy. It is very handy as it is very sleek yet in appropriate dimensions. The display is better than all the competitors in the same range. All in all its a must buy. The back of the glass is easily breakable. Standard phone for the price. A beautiful blend of glass and metal. A 16mp monster rear camera providing incredibly beautiful HDR quality images making using this phone even a better feeling. I dont have a very good experience with this phone becuase samsung is really slow and prices are comparatively higher. There are many better options like iphone, one plus five etc. 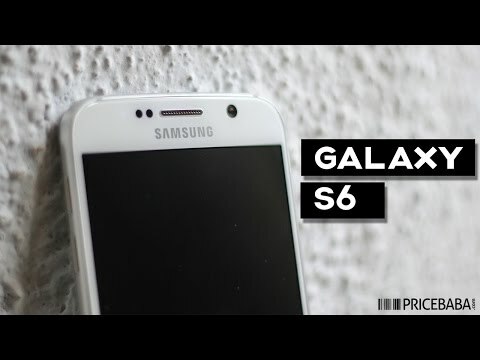 16 Pricebaba users have written their experience with Samsung Galaxy S6. If you own Samsung Galaxy S6, please do leave your feedback too. Last years Galaxy S5 wasnt quite successful for Samsung as the smartphone received lot of flak for its repetitive, plasticky body-design and uninspiring software filled with bloatware. This year the company is back with not just one but two models -- Galaxy S6 and Galaxy S6 Edge. Although almost identical, both the phones translate Samsungs efforts to reboot its phone design strategy by offering beautiful glass and metal-clad bodies, honing top-of-the-line cameras and shipping them with a smoother, bloatware-free software a.ka. TouchWiz. A non-removable 2550mAh battery is packed in and support for both Qi & PMA Wireless Charging is present. On the connectivity front, the Galaxy S6 comes with WiFi: 802.11 a/b/g/n/ac (2.4/5GHz), Wi-Fi Direct, Bluetooth: v4.1, USB 2.0, NFC, IR Remote and supports VoLTE as well. Its available in White Pearl, Black Sapphire, Gold Platinum and Blue Topaz color variants. Update: Samsung Galaxy S7 is the successor to this phone.